In the regular WebService class, setting the wsdl property will trigger the loadWSDL method, but since we are embedding the WSDL, we must manually call the loadWSDL method. I do that in the constructor. Embedded assets become a class, so first an instance of that class must be instantiated as a ByteArrayAsset (the default type for files embedded with the application/octet-stream mimeType). Then the instance is read into a string. Then the deriveHTTPService method is called to set up the underlying HTTPService‘s channel information. Finally, we create a WSDL object from the XML that was read from the ByteArrayAsset, create a new WSDLLoadEvent with the WSDL, and call the wsdlHandler method, passing it the wsdlLoadEvent. This essentially is doing the same thing as the original WebService class, but now doing it without the network request. Now it all made sense! Since we didn’t call super(), Flex conveniently inserted a super() call for us! Fun. So we had to figure out a way to convince the Flex compiler that we were going to call super(), but then not call it. Voila! Now the CensusSOAPService‘s constructor sets _serviceControl to a new instance of MyWebService and _Super_CensusSOAPService doesn’t get the chance to mess that up. 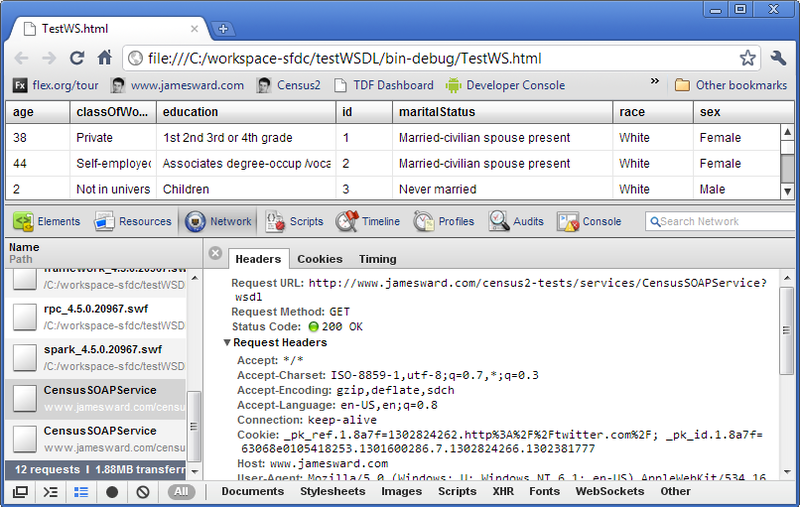 We tested the new CensusSOAPService and everything worked perfectly! I hope that helps some of you who are using the Flex WebService API. Let me know if you have any questions. Adobe TV has published a video I did recently about connecting Flex to a SOAP Webservice. Check it out and let me know what you think.